It's the last day of February and the last day of LOAD 214. I've really enjoyed the challenges this month. 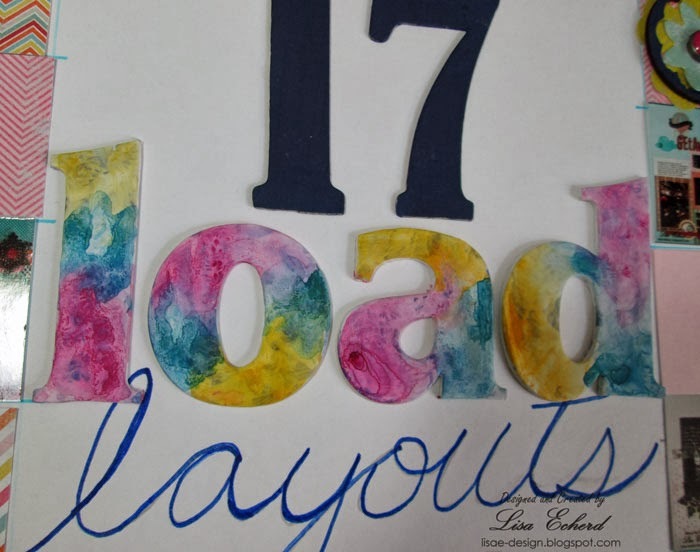 I did 17 layouts for LOAD! Plus I did a couple of other layouts for my new class Two Page Terrific so it was a very busy month. Many of my layouts have process videos. There are a few that don't and I'll put those in a page share video a bit later on. Today I have a layout that shows a thumbnail of the completed LOAD layouts. I remember hearing this idea early on in the program - to do a page at the end to commemorate the work done this month. I thought it was a wonderful idea. 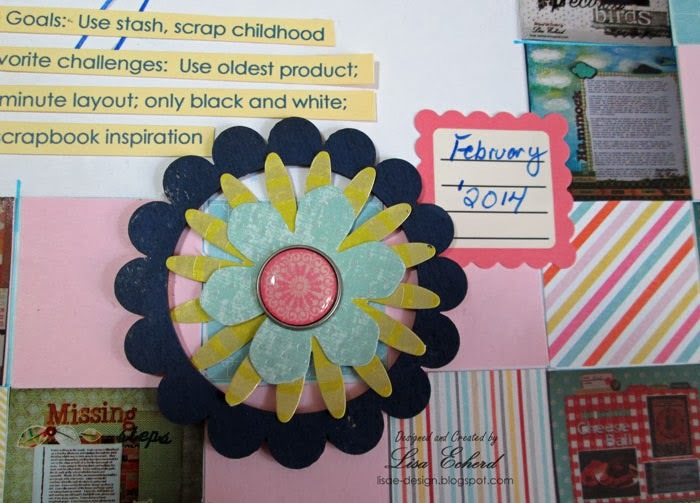 My goals for LOAD were to try some new things, scrap childhood photos and use my stash. I put a good dent in all of those. The challenges I most enjoyed and would never have tried on my own were an under 30 minute page and doing a page in only black and white. That was a real stretch. There are still a couple of challenges I didn't get to that I'd like to try. I worked through a couple of paper collections clearing space for new stuff and made a dent in others. Also I did quite a few childhood photos and told stories I hadn't even thought about. I really love my pages from this month! LOAD is a great scrapping experience and I urge you to give it a try sometime. I'll have info on upcoming LOADS as they come along. For the page, I created a reverse grid sketch. I call it a reverse grid because most grids are in the middle of the page. For this one I have the title and journaling in the middle and the 1 1/2" grid on the outside edges. It was a tedious sketch to create but it took a lot of the guess work out of creating the layout. As you'll see from the video I made one change and that was to add more cardstock squares to the grid. Also, last call for the Anniversary Giveaway winner I drew last Friday - Shelley C, please contact me by this Saturday evening (Mar 1) about the prize. (There isn't an e-mail linked to the comment.) If I don't hear from Shelley, I'll draw another name and announce it on my next blog post. Thanks for visiting! If you haven't seen my new class info, please check it out here. The class is called Two Page Terrific! I'd love to have you join me as we find solutions to the challenges of creating a two pager. Another great layout and wonderful sketch. 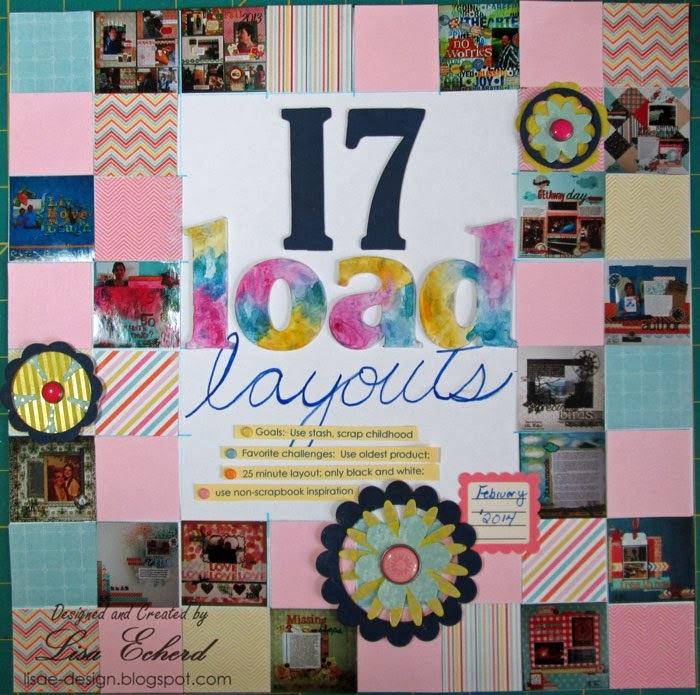 I am impressed with how many layouts you have completed this month, and they were all so wonderful. Oh my goodness! This sketch is fabulous... It looks amazing. Congrats on completing so many layouts!